For its one hundredth episode, you might expect The Simpsons to go really big with an episode that’s a veritable extravaganza of a fandango of a lollapalooza, possibly involving the popular alternate rock musical festival Lollapalooza. The show has never been afraid to dazzle viewers with star-power or outrageous premises involving Homer going to outer space, becoming a pop star or being a suspect in the shooting of Mr. Burns. Heck, the fifth season began with an appearance from an actual Beatle in an episode-length tribute to all things Fab Four, so it would not seem out of place for the show to try to top itself with this landmark episode. Instead, The Simpsons chose an antithetical tactic. Rather than going big and star-studded with its 100th episode, it got intimate and small with one of the subtlest episodes of the show’s 1990s golden years. “Sweet Seymour Skinner’s Baadasssss Song” is full of wonderfully realized little moments that convey volumes about characters, like the newly unemployed and rudderless Principal Skinner reciting the invariably hyperbolic names of laundry detergents. Nobody is going to buy a detergent called “Adequate” with so many superlatively-named competitors on the shelves, and Harry Shearer’s deadpan inflection clashes amusingly with the chipper words coming out of his mouth. The episode plunges deep inside the buttoned-down mind of Principal Skinner, exploring the sour sadness of his life with clear-eyed compassion and pity. Everything Santa’s Little Helper does strikes the class as magical. When he sneezes, Ms. Krabappel replies delightedly, “He thinks he’s people!”, a line that has become an internet meme over the years on account of it being awesome and awesomely re-usable. Even creepy Groundskeeper Willie is not immune to Santa’s Little Helper’s canine charms. Bart’s triumph is short-lived, however, as Santa’s Little Helper eventually makes it into the air ducts of the school, where a greased-up Groundskeeper Willie is dispensed to retrieve him. When Willie becomes stuck in the air ducts himself, it leads to a crisis that results in Principal Skinner losing the job that has come to define him. The indignity reaches its peak as an enraged Superintendent Chalmers reams Skinner out for, among other transgressions, “class after class of ugly, ugly children,” another of those all-time great throwaway lines. Without children to whip into shape or a superintendent to accidentally antagonize, Skinner is a man without a country, a king without a kingdom, and, in less metaphorical terms, a Principal without a school to lead. Who is Skinner without his job? I suspect that every child experiences a moment of intense cognitive dissonance the first time they see an authority figure like a teacher or priest or baseball umpire outside of their usual context. It almost feels like you’re seeing something you shouldn’t be seeing, that merely by virtue of, say, being at the same convenience store on a Tuesday night as your biology teacher, you are somehow interfering with their personal life, making them briefly uncomfortable with the prospect of unstructured conversation. “Sweet Seymour Skinner’s Baadasssss Song” beautifully captures this jarring phenomenon when Milhouse and Bart spy Skinner in street clothes after he’s been relieved of his job and Milhouse says of the man they thought they knew well, “I think he’s gone crazy! He’s not wearing a suit or tie or anything.” Seeing Skinner outside of class inspires a confusing tumult of emotions within Bart: Shame for having started the chain of events that led to him losing his job, awkwardness over the uncertain nature of their new relationship and intense self-consciousness over how to communicate with Skinner outside the boundaries of their well-developed antagonistic relationship. Skinner losing his job doesn’t just cause Bart to see his relationship with his premier enemy differently. It causes him to re-examine his own existence as well. Who is he without his enemy? Who is Wile E. Coyote without Road Runner? Just an anthropomorphic coyote who exhibits incredible brand loyalty to Acme despite their products failing him 100 percent of the time. And who is Road Runner without Wile E. Coyote? Merely an unusually fast bird that makes odd, repetitive noises. 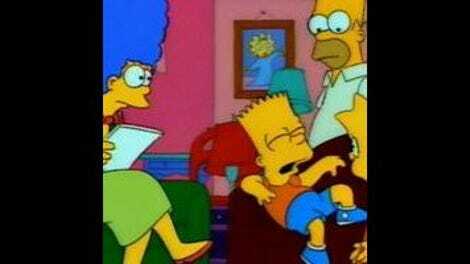 Instead of feeling validated, Bart is bummed out by Skinner falling from his perch. It isn’t just Skinner that feels rudderless; without Skinner to bump heads with, Bart feels lost and there are some wonderfully subdued, subtle scenes of Bart and Skinner attempting to connect with each other in this weird new phase of their relationship. Yes, there are few things in the world more jarring to children than seeing familiar faces in unfamiliar new contexts so it’s also a little weird for Bart when Ned Flanders takes over for Skinner. Flanders rules the school with such a soft touch that it isn’t long until the school has devolved into a Lord Of The Flies-like state of complete lawlessness, with Martin, that eternal symbol of fancy-pants civilization, imprisoned in a cage. 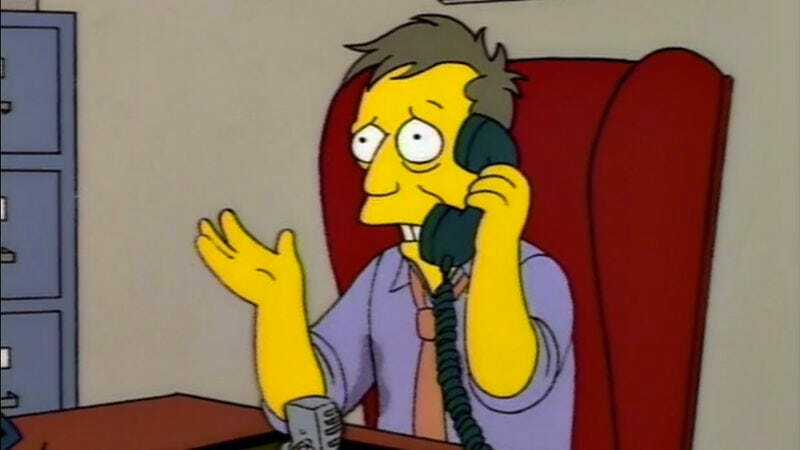 “Sweet Seymour Skinner’s Baadassss Song” ends as it must: With Skinner back as principal. He and Bart are comfortably enemies once more but a little of their short-lived friendship remains when Bart impishly puts a sign on Skinner’s back and Skinner in turn puts a sign reading, “Teach Me” on Bart’s back. Instead of proving to the world how big and crazy and outrageous it could be, The Simpsons instead proved just how powerful and funny it could be at its quietest. I love the incredibly cavalier, nonchalant way, Chalmers says, “The way America’s public school are sliding, they’ll all be this way in a few months. It’s a hell of a toboggan ride!” in response to the complete breakdown of civilization at his school. Next up is “The Boy Who Knew Too Much.” If memory serves, it’s a good one, but you didn’t hear that from me, understand?